Lee, H., Park, K., Kim, J., Kuchenbecker, K. J.
Spiers, A., Kuchenbecker, K. J. Since the 1960s, technologists have worked to develop systems that facilitate independent navigation by vision-impaired (VI) pedestrians. These devices vary in terms of conveyed information and feedback modality. Unfortunately, many such prototypes never progress beyond laboratory testing. Conversely, smartphone-based navigation systems for sighted pedestrians have grown in robustness and capabilities, to the point of now being ubiquitous. How can we leverage the success of sighted navigation technology, which is driven by a larger global market, as a way to progress VI navigation systems? We believe one possibility is to make common devices that benefit both VI and sighted individuals, by providing information in a way that does not distract either user from their tasks or environment. To this end we have developed physical interfaces that eschew visual, audio or vibratory feedback, instead relying on the natural human ability to perceive the shape of a handheld object. Richardson, B. A., Kuchenbecker, K. J. Humans can form an impression of how a new object feels simply by touching its surfaces with the densely innervated skin of the fingertips. Many haptics researchers have recently been working to endow robots with similar levels of haptic intelligence, but these efforts almost always employ hand-crafted features, which are brittle, and concrete tasks, such as object recognition. We applied unsupervised feature learning methods, specifically K-SVD and Spatio-Temporal Hierarchical Matching Pursuit (ST-HMP), to rich multi-modal haptic data from a diverse dataset. We then tested the learned features on 19 more abstract binary classification tasks that center on haptic adjectives such as smooth and squishy. The learned features proved superior to traditional hand-crafted features by a large margin, almost doubling the average F1 score across all adjectives. Additionally, particular exploratory procedures (EPs) and sensor channels were found to support perception of certain haptic adjectives, underlining the need for diverse interactions and multi-modal haptic data. Cao, E., Machaca, S., Bernard, T., Wolfinger, B., Patterson, Z., Chi, A., Adrales, G. L., Kuchenbecker, K. J., Brown, J. D.
Forte, M. P., Kuchenbecker, K. J. How Does It Feel to Clap Hands with a Robot? Fitter, N. T., Kuchenbecker, K. J. 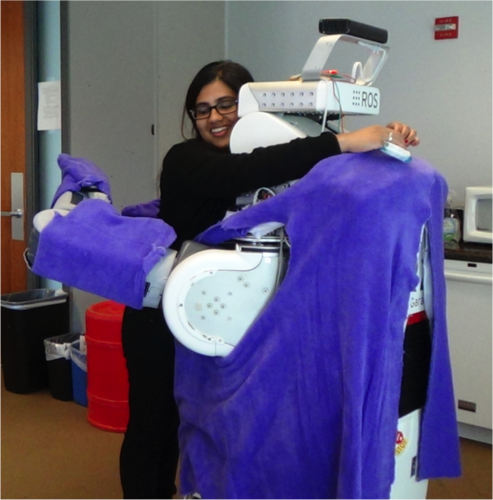 Future robots may need lighthearted physical interaction capabilities to connect with people in meaningful ways. To begin exploring how users perceive playful human–robot hand-to-hand interaction, we conducted a study with 20 participants. 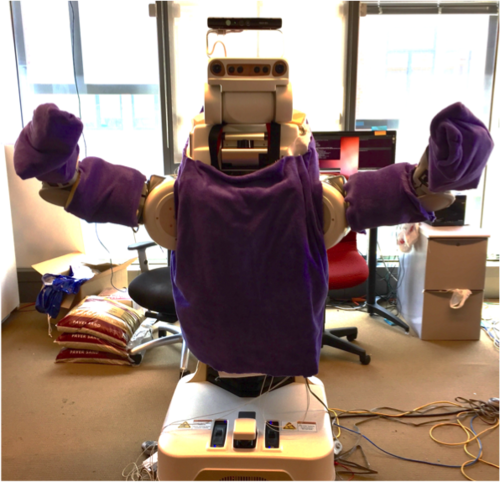 Each user played simple hand-clapping games with the Rethink Robotics Baxter Research Robot during a 1-h-long session involving 24 randomly ordered conditions that varied in facial reactivity, physical reactivity, arm stiffness, and clapping tempo. Survey data and experiment recordings demonstrate that this interaction is viable: all users successfully completed the experiment and mentioned enjoying at least one game without prompting. Hand-clapping tempo was highly salient to users, and human-like robot errors were more widely accepted than mechanical errors. Furthermore, perceptions of Baxter varied in the following statistically significant ways: facial reactivity increased the robot’s perceived pleasantness and energeticness; physical reactivity decreased pleasantness, energeticness, and dominance; higher arm stiffness increased safety and decreased dominance; and faster tempo increased energeticness and increased dominance. These findings can motivate and guide roboticists who want to design social–physical human–robot interactions. Park, G., Kuchenbecker, K. J. For simple and realistic vibrotactile feedback, 3D accelerations from real contact interactions are usually rendered using a single-axis vibration actuator; this dimensional reduction can be performed in many ways. This demonstration implements a real-time conversion system that simultaneously measures 3D accelerations and renders corresponding 1D vibrations using a two-pen interface. In the demonstration, a user freely interacts with various objects using an In-Pen that contains a 3-axis accelerometer. The captured accelerations are converted to a single-axis signal, and an Out-Pen renders the reduced signal for the user to feel. We prepared seven conversion methods from the simple use of a single-axis signal to applying principal component analysis (PCA) so that users can compare the performance of each conversion method in this demonstration. Large-scale tactile sensing is important for household robots and human-robot interaction because contacts can occur all over a robot’s body surface. This paper presents a new fabric-based tactile sensor that is straightforward to manufacture and can cover a large area. The tactile sensor is made of conductive and non-conductive fabric layers, and the electrodes are stitched with conductive thread, so the resulting device is flexible and stretchable. The sensor utilizes internal array electrodes and a reconstruction method called electrical resistance tomography (ERT) to achieve a high spatial resolution with a small number of electrodes. The developed sensor shows that only 16 electrodes can accurately estimate single and multiple contacts over a square that measures 20 cm by 20 cm. Autonomous robots need to efficiently walk over varied surfaces and grasp diverse objects. We hypothesize that the association between how such surfaces look and how they physically feel during contact can be learned from a database of matched haptic and visual data recorded from various end-effectors' interactions with hundreds of real-world surfaces. Testing this hypothesis required the creation of a new multimodal sensing apparatus, the collection of a large multimodal dataset, and development of a machine-learning pipeline. This thesis begins by describing the design and construction of the Portable Robotic Optical/Tactile ObservatioN PACKage (PROTONPACK, or Proton for short), an untethered handheld sensing device that emulates the capabilities of the human senses of vision and touch. Its sensory modalities include RGBD vision, egomotion, contact force, and contact vibration. Three interchangeable end-effectors (a steel tooling ball, an OptoForce three-axis force sensor, and a SynTouch BioTac artificial fingertip) allow for different material properties at the contact point and provide additional tactile data. We then detail the calibration process for the motion and force sensing systems, as well as several proof-of-concept surface discrimination experiments that demonstrate the reliability of the device and the utility of the data it collects. 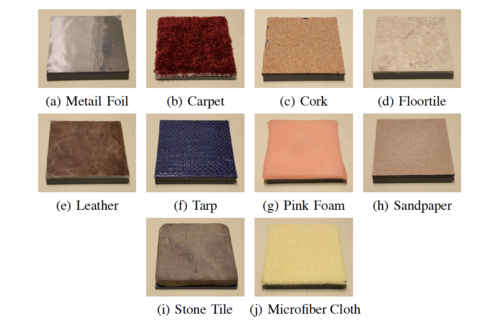 This thesis then presents a large-scale dataset of multimodal surface interaction recordings, including 357 unique surfaces such as furniture, fabrics, outdoor fixtures, and items from several private and public material sample collections. Each surface was touched with one, two, or three end-effectors, comprising approximately one minute per end-effector of tapping and dragging at various forces and speeds. We hope that the larger community of robotics researchers will find broad applications for the published dataset. 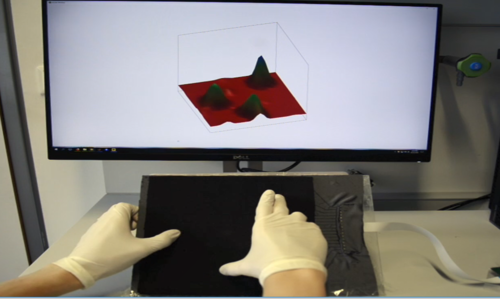 Lastly, we demonstrate an algorithm that learns to estimate haptic surface properties given visual input. Surfaces were rated on hardness, roughness, stickiness, and temperature by the human experimenter and by a pool of purely visual observers. Then we trained an algorithm to perform the same task as well as infer quantitative properties calculated from the haptic data. Overall, the task of predicting haptic properties from vision alone proved difficult for both humans and computers, but a hybrid algorithm using a deep neural network and a support vector machine achieved a correlation between expected and actual regression output between approximately ρ = 0.3 and ρ = 0.5 on previously unseen surfaces. Pacchierotti, C., Young, E. M., Kuchenbecker, K. J. Small size and low weight are critical requirements for wearable and portable haptic interfaces, making it essential to work toward the optimization of their sensing and actuation systems. This paper presents a new approach for task-driven design optimization of fingertip cutaneous haptic devices. Given one (or more) target tactile interactions to render and a cutaneous device to optimize, we evaluate the minimum number and best configuration of the device’s actuators to minimize the estimated haptic rendering error. First, we calculate the motion needed for the original cutaneous device to render the considered target interaction. Then, we run a principal component analysis (PCA) to search for possible couplings between the original motor inputs, looking also for the best way to reconfigure them. If some couplings exist, we can re-design our cutaneous device with fewer motors, optimally configured to render the target tactile sensation. The proposed approach is quite general and can be applied to different tactile sensors and cutaneous devices. We validated it using a BioTac tactile sensor and custom plate-based 3-DoF and 6-DoF fingertip cutaneous devices, considering six representative target tactile interactions. The algorithm was able to find couplings between each device’s motor inputs, proving it to be a viable approach to optimize the design of wearable and portable cutaneous devices. Finally, we present two examples of optimized designs for our 3-DoF fingertip cutaneous device. The broader research objective of this line of research is to test the hypothesis that real-time stereo video analysis and augmented reality can increase safety and task efficiency in robot-assisted surgery. This master’s thesis aims to solve the first step needed to achieve this goal: the creation of a robust system that delivers the envisioned feedback to a surgeon while he or she controls a surgical robot that is identical to those used on human patients. Several approaches for applying augmented reality to da Vinci Surgical Systems have been proposed, but none of them entirely rely on a clinical robot; specifically, they require additional sensors, depend on access to the da Vinci API, are designed for a very specific task, or were tested on systems that are starkly different from those in clinical use. There has also been prior work that presents the real-world camera view and the computer graphics on separate screens, or not in real time. In other scenarios, the digital information is overlaid manually by the surgeons themselves or by computer scientists, rather than being generated automatically in response to the surgeon’s actions. We attempted to overcome the aforementioned constraints by acquiring input signals from the da Vinci stereo endoscope and providing augmented reality to the console in real time (less than 150 ms delay, including the 62 ms of inherent latency of the da Vinci). The potential benefits of the resulting system are broad because it was built to be general, rather than customized for any specific task. The entire platform is compatible with any generation of the da Vinci System and does not require a dVRK (da Vinci Research Kit) or access to the API. Thus, it can be applied to existing da Vinci Systems in operating rooms around the world. Colleagues often shake hands in greeting, friends connect through high fives, and children around the world rejoice in hand-clapping games. As robots become more common in everyday human life, they will have the opportunity to join in these social-physical interactions, but few current robots are intended to touch people in friendly ways. 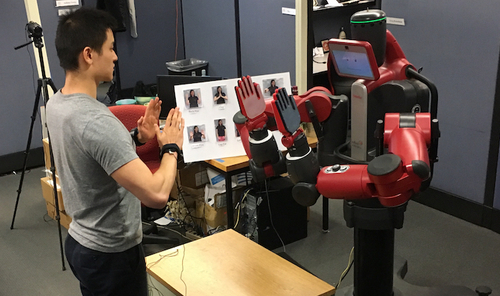 This article describes how we enabled a Baxter Research Robot to both teach and learn bimanual hand-clapping games with a human partner. Our system monitors the user's motions via a pair of inertial measurement units (IMUs) worn on the wrists. We recorded a labeled library of 10 common hand-clapping movements from 10 participants; this dataset was used to train an SVM classifier to automatically identify hand-clapping motions from previously unseen participants with a test-set classification accuracy of 97.0%. Baxter uses these sensors and this classifier to quickly identify the motions of its human gameplay partner, so that it can join in hand-clapping games. This system was evaluated by N = 24 naïve users in an experiment that involved learning sequences of eight motions from Baxter, teaching Baxter eight-motion game patterns, and completing a free interaction period. The motion classification accuracy in this less structured setting was 85.9%, primarily due to unexpected variations in motion timing. The quantitative task performance results and qualitative participant survey responses showed that learning games from Baxter was significantly easier than teaching games to Baxter, and that the teaching role caused users to consider more teamwork aspects of the gameplay. Over the course of the experiment, people felt more understood by Baxter and became more willing to follow the example of the robot. Users felt uniformly safe interacting with Baxter, and they expressed positive opinions of Baxter and reported fun interacting with the robot. 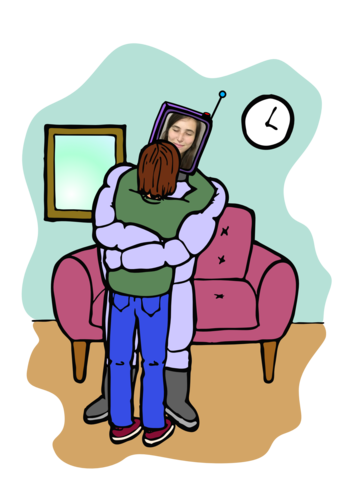 Taken together, the results indicate that this robot achieved credible social-physical interaction with humans and that its ability to both lead and follow systematically changed the human partner's experience. In this demonstration, you will hold two pen-shaped modules: an in-pen and an out-pen. The in-pen is instrumented with a high-bandwidth three-axis accelerometer, and the out-pen contains a one-axis voice coil actuator. Use the in-pen to interact with different surfaces; the measured 3D accelerations are continually converted into 1D vibrations and rendered with the out-pen for you to feel. You can test conversion methods that range from simply selecting a single axis to applying a discrete Fourier transform or principal component analysis for realistic and brisk real-time conversion. Burns, R., Kuchenbecker, K. J. Children with autism often endure sensory overload, may be nonverbal, and have difficulty understanding and relaying emotions. These experiences result in heightened stress during social interaction. Animal-assisted intervention has been found to improve the behavior of children with autism during social interaction, but live animal companions are not always feasible. We are thus in the process of designing a robotic animal to mimic some successful characteristics of animal-assisted intervention while trying to improve on others. The over-arching hypothesis of this research is that an appropriately designed robot animal can reduce stress in children with autism and empower them to engage in social interaction. Young, E., Kuchenbecker, K. J.
Lee, H., Kim, J., Kuchenbecker, K. J.
Oquendo, Y. A., Riddle, E. W., Hiller, D., Blinman, T. A., Kuchenbecker, K. J.
Fingertips and hands captivate the attention of most haptic interface designers, but humans can feel touch stimuli across the entire body surface. Trying to create devices that both can be worn and can deliver good haptic sensations raises challenges that rarely arise in other contexts. Most notably, tactile cues such as vibration, tapping, and squeezing are far simpler to implement in wearable systems than kinesthetic haptic feedback. This interactive discussion will present a variety of relevant projects to which I have contributed, attempting to pull out common themes and ideas for the future. Seifi, H., MacLean, K. E., Kuchenbecker, K. J., Park, G.
Much of three decades of haptic device invention is effectively lost to today’s designers: dispersion across time, region, and discipline imposes an incalculable drag on innovation in this field. Our goal is to make historical haptic invention accessible through interactive navigation of a comprehensive library – a Haptipedia – of devices that have been annotated with designer-relevant metadata. To build this open resource, we will systematically mine the literature and engage the haptics community for expert annotation. 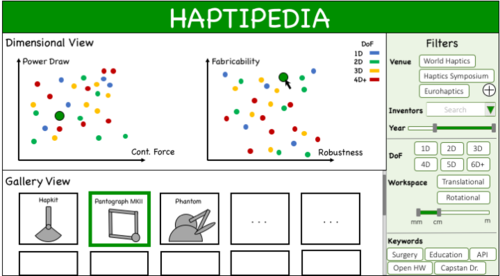 In a multi-year broad-based initiative, we will empirically derive salient attributes of haptic devices, design an interactive visualization tool where device creators and repurposers can efficiently explore and search Haptipedia, and establish methods and tools to manually and algorithmically collect data from the haptics literature and our community of experts. This paper outlines progress in compiling an initial corpus of grounded force-feedback devices and their attributes, and it presents a concept sketch of the interface we envision. Can Humans Infer Haptic Surface Properties from Images? Burka, A., Kuchenbecker, K. J. Human children typically experience their surroundings both visually and haptically, providing ample opportunities to learn rich cross-sensory associations. 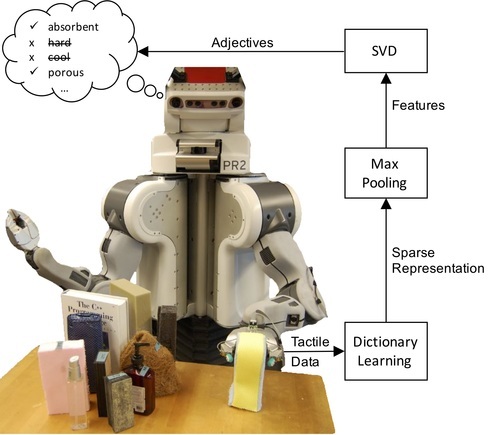 To thrive in human environments and interact with the real world, robots also need to build models of these cross-sensory associations; current advances in machine learning should make it possible to infer models from large amounts of data. We previously built a visuo-haptic sensing device, the Proton Pack, and are using it to collect a large database of matched multimodal data from tool-surface interactions. As a benchmark to compare with machine learning performance, we conducted a human subject study (n = 84) on estimating haptic surface properties (here: hardness, roughness, friction, and warmness) from images. Using a 100-surface subset of our database, we showed images to study participants and collected 5635 ratings of the four haptic properties, which we compared with ratings made by the Proton Pack operator and with physical data recorded using motion, force, and vibration sensors. Preliminary results indicate weak correlation between participant and operator ratings, but potential for matching up certain human ratings (particularly hardness and roughness) with features from the literature. Ma, L., Stueckler, J., Wu, T., Cremers, D.
Bur, A. M., Gomez, E. D., Newman, J. G., Weinstein, G. S., Bert W. O’Malley, J., Rassekh, C. H., Kuchenbecker, K. J.
Hand-clapping games and other forms of rhythmic social-physical interaction might help foster human-robot teamwork, but the design of such interactions has scarcely been explored. We leveraged our prior work to enable the Rethink Robotics Baxter Research Robot to competently play one-handed tempo-matching hand-clapping games with a human user. To understand how such a robot’s capabilities and behaviors affect user perception, we created four versions of this interaction: the hand clapping could be initiated by either the robot or the human, and the non-initiating partner could be either cooperative, yielding synchronous motion, or mischievously uncooperative. Twenty adults tested two clapping tempos in each of these four interaction modes in a random order, rating every trial on standardized scales. The study results showed that having the robot initiate the interaction gave it a more dominant perceived personality. Despite previous results on the intrigue of misbehaving robots, we found that moving synchronously with the robot almost always made the interaction more enjoyable, less mentally taxing, less physically demanding, and lower effort for users than asynchronous interactions caused by robot or human mischief. Taken together, our results indicate that cooperative rhythmic social-physical interaction has the potential to strengthen human-robot partnerships. Brown, J. D., O’Brien, C. E., Leung, S. C., Dumon, K. R., Lee, D. I., Kuchenbecker, K. J.
Ng, C., Zareinia, K., Sun, Q., Kuchenbecker, K. J.
Culbertson, H., Kuchenbecker, K. J. Young, E. M., Kuchenbecker, K. J. 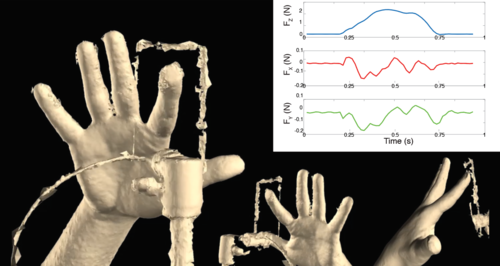 Despite rapid advancements in the field of fingertip haptics, rendering tactile cues with six degrees of freedom (6 DOF) remains an elusive challenge. 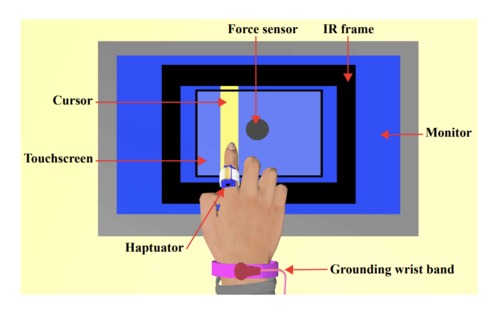 In this paper, we investigate the potential of displaying fingertip haptic sensations with a 6-DOF parallel continuum manipulator (PCM) that mounts to the user's index finger and moves a contact platform around the fingertip. Compared to traditional mechanisms composed of rigid links and discrete joints, PCMs have the potential to be strong, dexterous, and compact, but they are also more complicated to design. We define the design space of 6-DOF parallel continuum manipulators and outline a process for refining such a device for fingertip haptic applications. Following extensive simulation, we obtain 12 designs that meet our specifications, construct a manually actuated prototype of one such design, and evaluate the simulation's ability to accurately predict the prototype's motion. Finally, we demonstrate the range of deliverable fingertip tactile cues, including a normal force into the finger and shear forces tangent to the finger at three extreme points on the boundary of the fingertip. Hu, S., Kuchenbecker, K. J. Clever electromechanical design is required to make the force feedback delivered by a kinesthetic haptic interface both strong and safe. This paper explores a onedimensional haptic force display that combines a DC motor and a magnetic particle brake on the same shaft. Rather than a rigid linkage, a spooled cable connects the user to the actuators to enable a large workspace, reduce the moving mass, and eliminate the sticky residual force from the brake. This design combines the high torque/power ratio of the brake and the active output capabilities of the motor to provide a wider range of forces than can be achieved with either actuator alone. A prototype of this device was built, its performance was characterized, and it was used to simulate constant force sources and virtual springs and dampers. Compared to the conventional design of using only a motor, the hybrid device can output higher unidirectional forces at the expense of free space feeling less free. Gurari, N., Okamura, A. M., Kuchenbecker, K. J. Brown, J. D., Fernandez, J. N., Cohen, S. P., Kuchenbecker, K. J. Over time, surgical trainees learn to compensate for the lack of haptic feedback in commercial robotic minimally invasive surgical systems. Incorporating touch cues into robotic surgery training could potentially shorten this learning process if the benefits of haptic feedback were sustained after it is removed. In this paper, we develop a wrist-squeezing haptic feedback system and evaluate whether it holds the potential to train novice da Vinci users to reduce the force they exert on a bimanual inanimate training task. Subjects were randomly divided into two groups according to a multiple baseline experimental design. Each of the ten participants moved a ring along a curved wire nine times while the haptic feedback was conditionally withheld, provided, and withheld again. The realtime tactile feedback of applied force magnitude significantly reduced the integral of the force produced by the da Vinci tools on the task materials, and this result remained even when the haptic feedback was removed. Overall, our findings suggest that wrist-squeezing force feedback can play an essential role in helping novice trainees learn to minimize the force they exert with a surgical robot.